Bisou is maturing into a beautiful young doe. 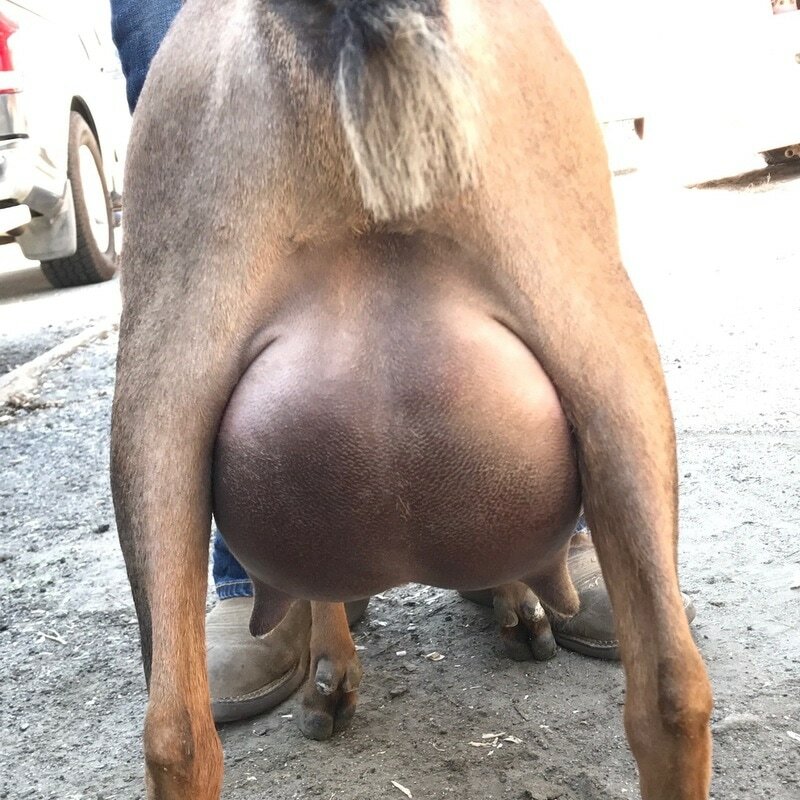 She freshened for the first time at just 13 months old and had a very impressive udder right out of the gate for such a young doe. Her udder is strongly attached with a nicely developed medial. She has very soft texture and milks down nicely. She performed very well at Linear Appraisals and we were most excited to have on record her very wide rump measurement. We think with another year of maturity she will be even more impressive as a two-year-old second freshener. Her Dam, Rose is a doe that impresses us more all the time. 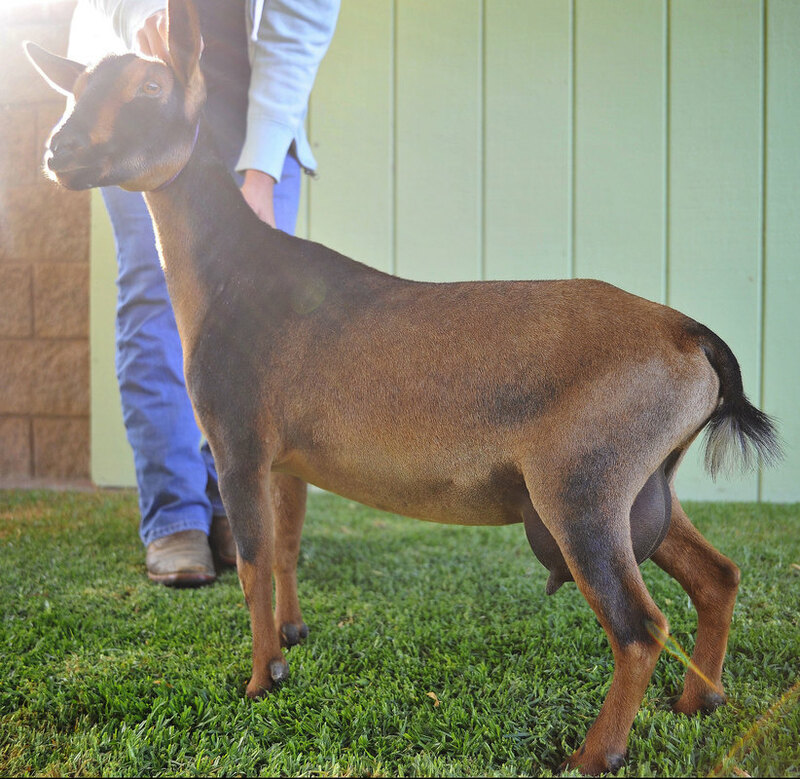 She has taken the show ring by storm, turning heads and racking up the firsts and reserves left and right. Then in 2017 became a finished Champion. Rose is no slouch in the milk room either, averaging over 3.9 lbs during her 2016 lactation. ​Bisou was our very first Higgs daughter to hit the ground. This litter was beautiful all around and it sure looks like Higgs is passing on the correctness in his pedigree down to Bisou and her siblings. Higgs parents are the infamous Drops of Jupiter and Zenith, two animals that many herds can trace their success back to. Higgs is tightly linebred on Zenith and we expect him to pass on her dairyness, correct conformation, and milking ability. Zeniths EEVE 90 LA was earned at 8 years old, where she held a V or E in every single category across the board. The correctness Higgs brings to this pedigree is exciting! As a very young first freshener Bisou has stood at the top of her class when shown. ​At the 2017 Linear Appraisals one score that is recorded behind the scenes is rump width. At just one year of age Bisou's rump width was 6". This is a width impressive for a senior doe let alone a yearling first freshener. Rump width is one attribute we would like to make a priority in our herd and we are so pleased to see our Sr herd sire Higgs Boson, passing his wide rump to our first retained daughter! 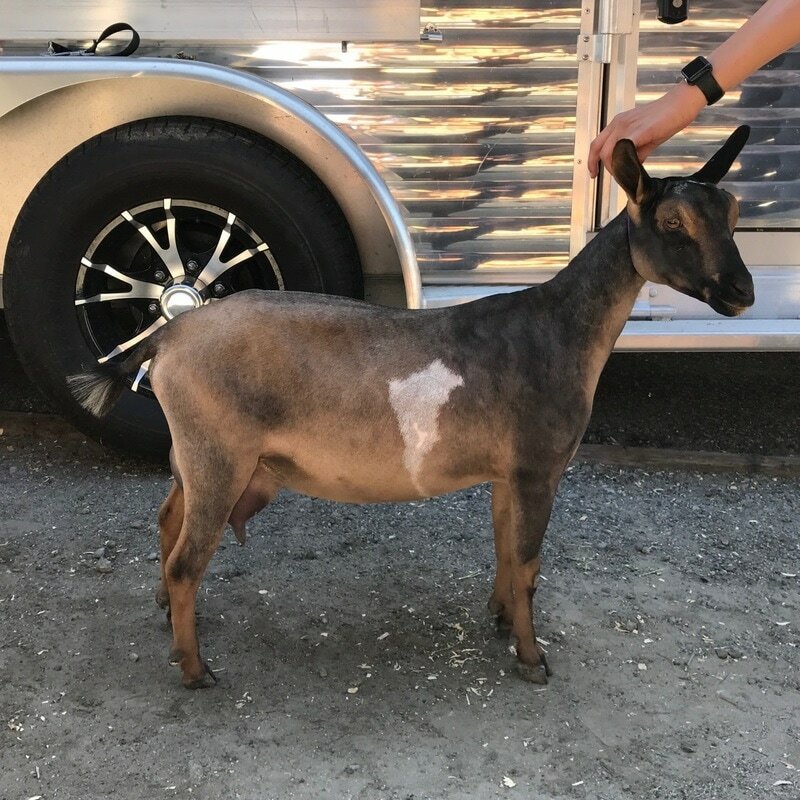 ​Bisou's dam, Sierra Aspen Honeymoon Rose, became a Finished Champion in 2017. Bisou will earn her AR Milk Star in Fat as a first freshener! Can't wait to see how well she produces next season. Very fast, easy kidding. Wish they were all this way!